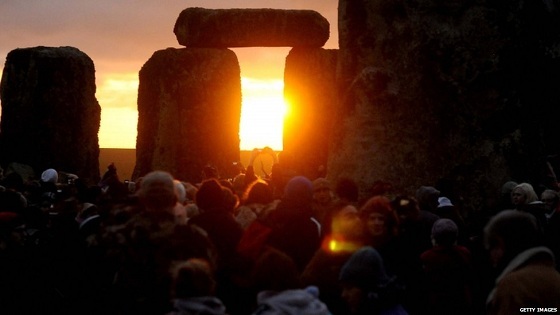 Several hours before the official solstice time of 11:12 amUTC* on December 21st 2012, this was what the sun looked like rising over Stonehenge, where about 5000 folks gathered to celebrate the turning of the seasons and/or the possible end of the world. Gorgeous. I’ve gotta get me to a stone circle for a solstice one of these days. I was hoping that I could get a nice shot of the sun setting over Sydney Harbour, but alas the cloud cover conspired against me. It was still a lovely day in the city though. I’ve gotta get me to a stone circle for a solstice one of these days. I nearly made it to Stonehenge for the winter solstice in 2006, but I hadn’t fully planned it through, and that was a big freeze year which made non-fully-planned-complete-with-Plan-B travel almost impossible, so I regretfully gave it a miss. There is something glorious about the ancient astronomical monuments in particular though, isn’t there? Perhaps because the fact that their original purpose is still operational is such a marvellous example of SCIENCE, IT WORKS. Got into a stoushlet with somebody the other day about ancient colossal architecture because zie was bemoaning the “lost” skills etc. Pointed out that colossal architecture is always an expression of power by the elite and that the elite choosing to fund more modern/efficient ways to build impressive monuments that better fit the purposes of today’s culture (rather than funding buildings that use ancient materials/techniques and consequently don’t have adequate spaces for modern elite activities) is not actually the same thing as architects/engineers/masons losing the ancient techniques, but zie didn’t want to hear it. Which would at least save on the airfare to the UK. I just missed the solstice time on last 21st December.But,I’m gonna participate next time.It’s a charming moment to watch the sun rising over Stonehenge!Also, the Stonehenge has a great popularity for it’s long time history.While my holidays I prefer to go there with my friends.